How to board an auto in Mumbai! We Dilliwallas are famous for being rash and rowdy. Ask a Dilliwalla to stand in a queue and you are sure to invite an unpleasant conversation. I recall many instances of women calling each other names in Delhi metro just because one woman asked another to be in a line and the other asked her to mind her business. 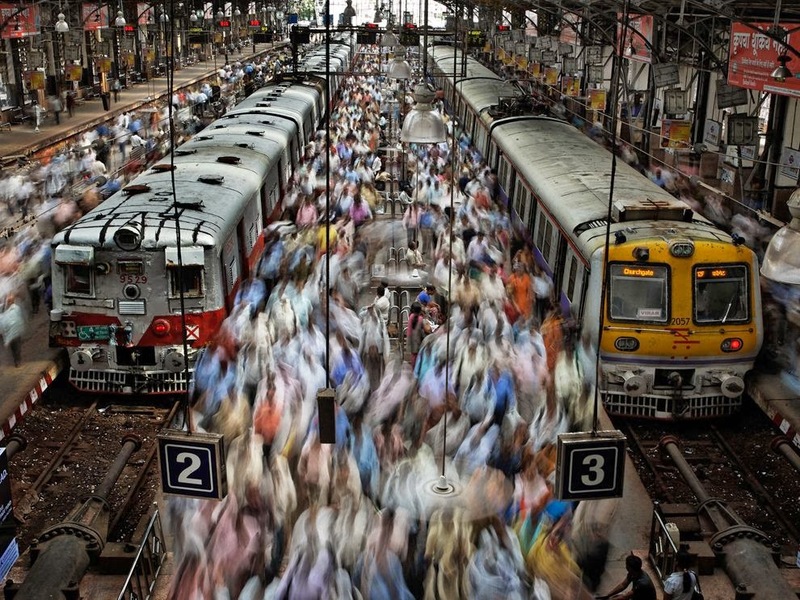 Though I am yet to experience the peak hours in Mumbai local trains, a recent instance made me familiar to the advantages of being patient in a queue. Yesterday I was trying to board an auto near one of the local train stations. First things first, in Delhi we have rickshaw and autos. But in Mumbai, there are only autos, which Mumbaikars call Rickshaws. And if someone asks you if you came by Rick, don’t be surprised, for rick or rickshaw or auto are all the same! Now Mumbai autowallas are much different from the ones in Delhi (and unless I dedicate a separate post to them, I won’t be doing justice). As I tried to stop autos, none even bothered to slow down and even listen to where I wanted to go. Ignored and dejected, as I wondered and worried, my eyes fell on a long queue at the roadside. Some 15-20 people were standing in a queue like disciplined school kids waiting for school bus. Hullow, we weren’t even that disciplined as school kids and the moment bus used to come, we used to get into junglee mode! Confused and curious, I thought of asking one of them, ‘’aakhir maajra kya hai’’ then my eyes fell on the umpteen autowallas that stopped near that line. So what did they have that autowallas stopped for them and not the others? Eureka! In Mumbai, they have a line for boarding autos!!! I looked at the auto and the last person in the queue who I had to join in case I wanted to be considered for auto. Being a rainy day, the size of the queue got me thinking. I have broken queues at several places in Dilli…my training ground being my school canteen and then the queue for college U Special. The rule is simple, survival of the fittest. But here, there wasn’t any scope of breaking queue. Unlike local trains, people maintained utter discipline and I didn’t want to come in the limelight as being an eager rule breaker! I soon realized the advantage of these auto queues. The autos that stopped here didn’t refuse to commute on your desired destination. Discipline pays at times. So i finally buy an umbrella! I have never been fond of umbrellas. Right from school days, umbrellas have been nothing but a burden in hands. I mean we just have two hands and holding an umbrella amounts to losing 50% of holding capacity! So in Delhi I avoided carrying an umbrella. Whenever it would rain I would take an auto or do some emotional blackmailing until someone from the family would drop me. Umbrellas drying in the office corridor were somehow considered tacky by most of the lot. The mantra was...better to wait at the metro station for 15 minutes than bearing the burden of an umbrella. How I often felt jealous of the princesses who had a servant to carry their umbrellas! Throughout the day I was consoling myself the rains would stop when its time to go home. But in Mumbai, rains rule the game. By the time I boarded the taxi, I was wet & irritated in rain. Even the taxi guy looked at me in pity and said " madam umbrella bhool gaya"
So this evening my frizzy hair forced me to visit an umbrella shop. Now in Mumbai I see people buying raincoats and umbrellas like we buy bread in Delhi every morning. By the time v chose one umbrella, the guy had already sold ten! I finally settled for a blue umbrella after been thoroughly confused by the wide variety of a thing as simple as an umbrella which v dilliwallas use more when walking in sun! The raincoats that are limited to bachcha party in Delhi r a style statement here...kids, college students, people driving two wheelers, aunties driving scooties, even the traffic police guys, all happily don their raincoats. U will get raincoats of every shape, size and style here. After all, when the rains don't stop, y should we? 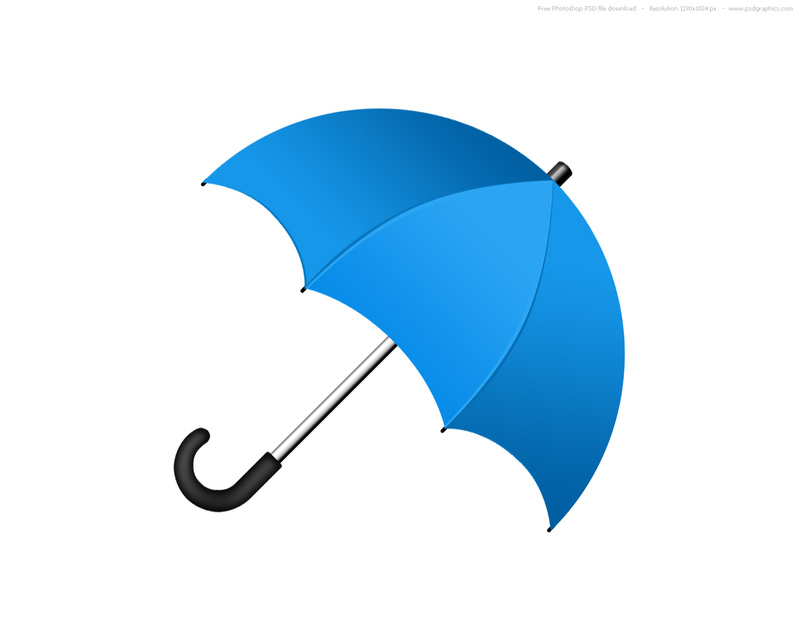 Its began to rain again...lemme go out and inaugurate my blue umbrella! My third day in Mumbai and I get a wet rainy welcome! Unlike Delhi, rains here come with its own whims and fancies. No storm, wind, dust…just clouds and rains are here, like guests who come uninvited. This time around, rains made Mumbaikars wait a lot, and finally arrived with me! Somehow all my friends have been telling me since morning – madam, you came and brought rains. Thinking of rains, the first thing that comes to my mind is ginger tea and hot pakodas, perhaps sooji halwa as well, if mom is in a generous mood. But since everything in Mumbai has a different nomenclature, pakodas here become Bhajiyas…big dumplings of potatoes (needless to say, sweet) and onions, bound generously in gramflour batter, and deep fried. As everybody in office enjoyed Bhajiyas, I missed Delhi, where we order an assortment of onion, potato, chilli, paneer pakodas. For first timers, rains may play spoilsport, but the normal Mumbaikar has befriended even the moody rains. Truly, the city never stops. While I was frowning at the sight of my sandals, spoiled in rains, my friends’ shoes were shining, despite their long travel in metro….oops locals. Aaakhir raaz kya hai? I wondered. Then a friend told me, people keep an extra pair of shoes in office, and wear plastic flip flops to work. Also, never before have I seen raincoats and umbrellas of this variety. Even spotted a guy wearing a plastic pants and enjoying the rains! Mumbai women too know, how to tweak fashion to their convenience. Spotted many women in sarees who had tied it like a skirt, but didn’t like to miss their local train! 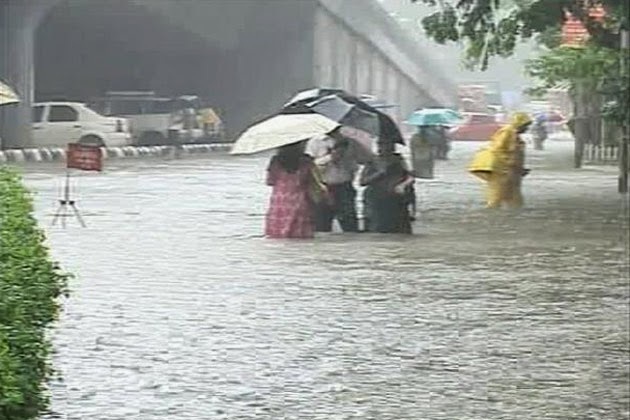 Throughout the day, I was looking at the rains, reading twitter updates about water logging (even the Mumbai metro wasn’t spared by rains) and wondering what would be the sight on roads in the evening. But what I saw in evening took me by surprise. Everyone went around doing their business as usual. Apart from few potholes, there were no major water logging on the roads. In Delhi, the day we have rains like this, reaching home is an endless struggle with water logging on every road. When things don’t go the way we want them to be, we go in the cribbing mode. Perhaps we should take inspiration from people who have learnt to befriend the odds. Not even a single person in office was making faces at the sight of heavy rains. 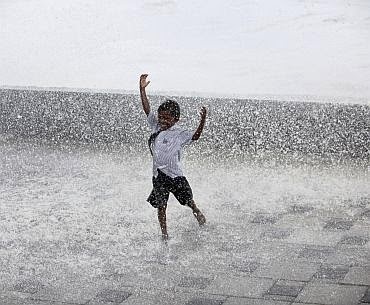 It was first major shower of the season, and Mumbaikars celebrated it like a festival with tea and Bhajiyas! As much as I miss Delhi, I also salute the spirit of Mumbai, the city that never stops. And before I sign off for the day, one more update…mom in law finally got her spicy food. She threatened the steward to prepare North Indian style North Indian food – hot n spicy else she will enter the kitchen and prepare herself! She will have to wait for a few days to relish her Dilliwalla alu subzi though! Finally, I am in Mumbai! To all my readers and friends who thought writers block has eaten my blogging frequency, I have an update – we have moved to Mumbai. As much as I dreaded and resisted moving out of Delhi, destiny proved its sense of humor. Mr. Hubby found greener pastures in Mumbai and I had to follow suit. So, since the last one month, I am like a cranky cow…yep…you read it right! Cranky cow, not a baby! Cranky, for obvious reasons. Delhi runs in my genes and heart and moving all the way 1400 something km away was just not acceptable to me. Cow – because no matter how much I revolt, I am a susheel, sanskari Indian wife, who prioritizes her hubby’s welfare over her choices. 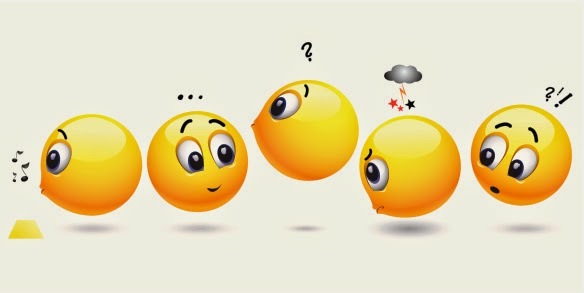 Transfer, packing, house are the key words running in my mind since the last one month and blogging suffered. Finally, we landed up in the Mayanagri yesterday and today I was off to work. Since morning, many people have asked me how did I find the place. I look at them for a second, then explain that it is too early to comment as I landed up yesterday only! 1. Everytime we are out, we are struggling with finding either the Eastern express highway or the western express highway, and I am still trying to figure how to memorize the easts and wests of the same locality. 2. The wide, well marked, concrete roads of Lutyens Delhi are replaced by slightly narrow roads which contributes to traffic jams. The shahi Dilliwalla in me, still likes to drive though friends tell me, soon I will start preferring local trains than dealing with traffic jams. 3. The city is always on the go. This morning, mom in law went for a walk around and all she saw was people rushing for their work. Young and old, everyone was in a hurry. MIL has been terribly missing her Dilliwalli gossip neighbour since then. 4. People really mind their own business. In Delhi one cannot imaging moving to a flat and not having a welcome tea and introduction session at the neighbour’s place; while other Padosans hop in to know the new lady in their colony. Out here, people have a lot of their own business to mind. Good for us though, coz I never liked the ever peeping Verm aunty in the Delhi neighbourhood. 5. If you are coming to Mumbai for the first time, get an understanding of some basic Gujrati/Marathi words, if not atleast the accent. I have to often ask routes from passersby and it takes me a minute to replay in my mind and understand what exactly s/he said! 6. Sweetness flows…I ate Dosa last night and for the first time in my life, I had sweet sambhar. In Delhi, women can be often seen scolding subziwallas for selling them potatoes that are sweet in taste, but here, since yesterday every potato dish I had was sweet. I truly madly deeply loved the Vada Pao though! 7. BEST buses are a treat to the eye…I even love their Bhopu and red colour! 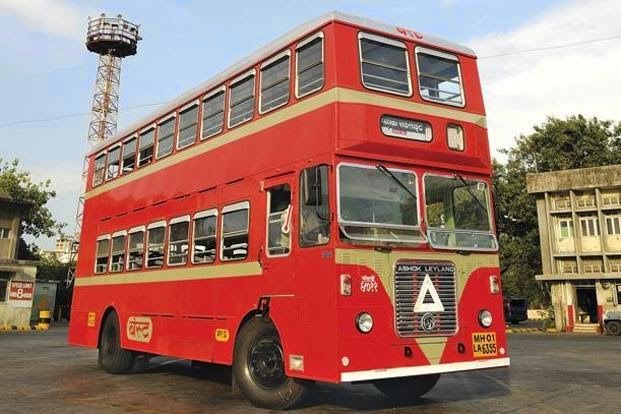 Since childhood, its in Mumbai that I have spotted a double decker bus again and I am looking forward to a ride. 8. I still haven’t bought grocery so yet to see if the vegetable vendor understands veggie names I know or will I have to take a crash course in veggie nomenclature. Yesterday I went to eat Dosa. After preparing the Dosa, the vendor asks me, “madam, eat here or parcel?”. Parcel? I wondered and for a second post office, inland letters and stamps floated in my mind. Then I told him “no parcel, eat here”. After 2 seconds, a kid came and asked the vendor “Uncle, gimme a parcel”. I wondered if he would actually take out a parcel from some shelf. All he took out was a polythene bag! So that’s the parcel! I got it!